Seohyun with TTS at the fansign event for the launching of iPhone 6 by mobile network operator LG U+ on October 31. Click pics for full res (1500×1000). Taeyeon, Tiffany and Seohyun attended an iPhone 6 launching event by LG Uplus – one of the big three Korean mobile network operators – in Seocho, Seoul, on October 31. The SNSD trio showcased the new iPhone to the media and handed a product set (with their autographs) to the first customer. Girls’ Generation members at a fansign event for LG in Seoul’s Gangnam District on November 12. Jessica was missing as she’s recovering from the airport mishap in Hong Kong (get well soon). Click pictures for full size (900×600). 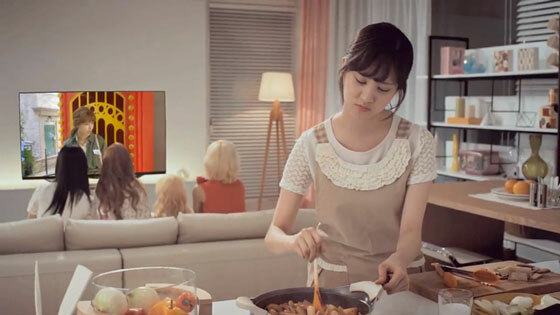 Screen captures from SNSD’s latest commercial for LG Cinema 3D Smart TV.